A 20-year veteran of Canadian masters basketball and member of the Manitoba Basketball Hall of Fame, Jude Kelly, has today been announced as an ambassador for the World Masters Games 2017, the world’s largest multi-sport event that kicks off in Auckland, New Zealand in just over a year. As well as becoming an ambassador, Kelly is also one of the first 10 WMG2017 participants to register for the Games. “He joins former New Zealand cricketer and Rugby World Cup CEO Martin Snedden and a mix of fellow sportspeople who represent the diversity of the masters sport movement,” she says. Kelly says he is honoured to join the WMG2017 ambassadors’ family and he and his Stooges basketball team mates are looking forward to defending the gold medal title (50+ Division) they won in 2013 at the Turin Italy World Masters Games. “New Zealand has been on my destination bucket list thanks largely to the Lord of the Rings films and I can’t think of a better way to combine playing the sport I love and visiting such a beautiful country,” he says. Basketball is one of 28 sports taking place across more than 45 competition venues during World Masters Games 2017. The minimum age for basketball is 30 and there are four competition divisions – A Grade Premier, B Grade Competitive, C Grade Recreational and Open. A and B grade age categories are in five year increments from 30 to 60+, C Grade increases in 10 yearly categories from 30 to 60+ and the Open Grade provides competition for men and women 65+, 70+ and 75+. There are three competition venues – North Shore Events Centre for A Grade Premier and B Grade Competitive, AUT University North Shore Campus for B Grade Competitive and Open Grade, and Bruce Pulman Park for C Grade Recreational. Kelly joins international Goodwill Ambassador Lord Sebastian Coe, former Olympic bronze medal swimmer Anthony Mosse, two-times Olympic medal winning volleyball coach Hugh McCutcheon and two Australians – world squash legend Sarah Fitz-Gerald and the fastest Olympic woman softball pitcher Jenny Holliday – as the internationally-based World Masters Games 2017 ambassadors. A further 12 ambassadors are based in New Zealand – Hamish Carter, Jenny-May Clarkson (nee Coffin), Garth Barfoot, Susie Simcock, Bryan Williams, Allison Roe, Noah Hickey, Cory Hutchings, Anna Stanley, Nathan Twaddle, Mark Orams and Duane Kale. The World Masters Games is the largest multi-sport event in the world. In terms of athlete numbers, it is bigger in scale than even the Olympics. Auckland will host the event from 21 to 30 April 2017 during which time 25,000 athletes will compete in 28 sports across 45 competition venues. The Games are regarded as the largest event New Zealand will host in at least the next decade. 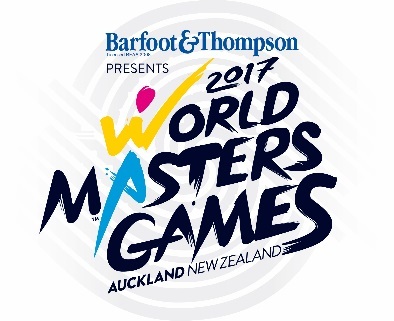 For more information visit www.worldmastersgames2017.co.nz.